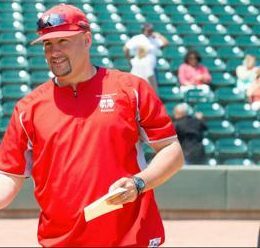 Winston Salem State University head baseball coach Kevin Ritsche collected his 300th career coaching victory in winning game one of a doubleheader sweep defeating Bluefield State College in game one 5-1 and 14-7 in game two. Kevin Ritsche was born and raised in Superior, Wisconson. After graduating high school, he attended the College of St. Scholastica in Duluth, Minnesota on a baseball scholarship where he was a standout baseball player. Ritsche earned Academic All-American honors twice in 2003 and 2004, and was an NAIA Baseball Honorable Mention All-American in 2004, while receiving his Bachelor of Arts and Master of Arts in Exercise Physiology from St. Scholastica. Ritsche was selected as the head coach at Winston Salem State in 2010. The University brought back baseball after the school shut the program down in 1973. In his first year as the skipper in 2011, Ritsche led his team to a 30-25 overall record and a 19-8 Central Intercollegiate Athletic Association (CIAA) conference record as the Rams won the conference tournament and were selected to compete in the NCAA Division II Atlantic Regional tournament. Since his hire, the baseball program has competed at the national level each year and are ranked regionally by the National Collegiate Baseball Writers Association (NCBWA) NCAA Division II Top 10 Poll. Under coach Ritsche, the Rams have been crowned HBCU national baseball champions in its small school divisions four times. Kevin Ritsche’s teams have achieved post season status making regional play seven out of nine season he’s been at the helm of Ram baseball. Ritsche, who is an academic disciplinarian to the players he coaches, has not had a losing season since his arrival. The fruits of his labor came when standout player Randy Norris became the program’s first ever player from Winston Salem State to be selected in a Major League Baseball Draft (19th round in 2018 by the San Francisco Giants). Norris, was the 556th player chosen overall.